Earlier this week, I found myself lying on my back in the tight crawlspace beneath a house at our Platte River Prairies, helping our land manager fix a ruptured water line. For this claustrophobic prairie ecologist, the dark cramped space under that double wide trailer house was a test of psychological endurance. As soon as the repair was finished, I found myself in desperate need of a walk under the big open sky. Fortunately, that sky was mottled with attractive clouds, and one of our restored wetlands was close by, so I grabbed my camera and took a nice restorative hike. 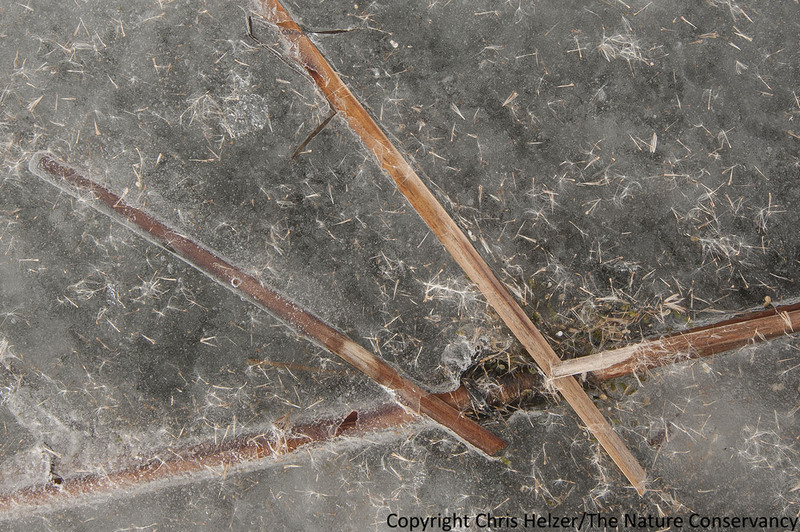 This frozen stream/wetland had plenty of interesting textures and shapes to look at and photograph. Most importantly, however, it was big, wide, and open. 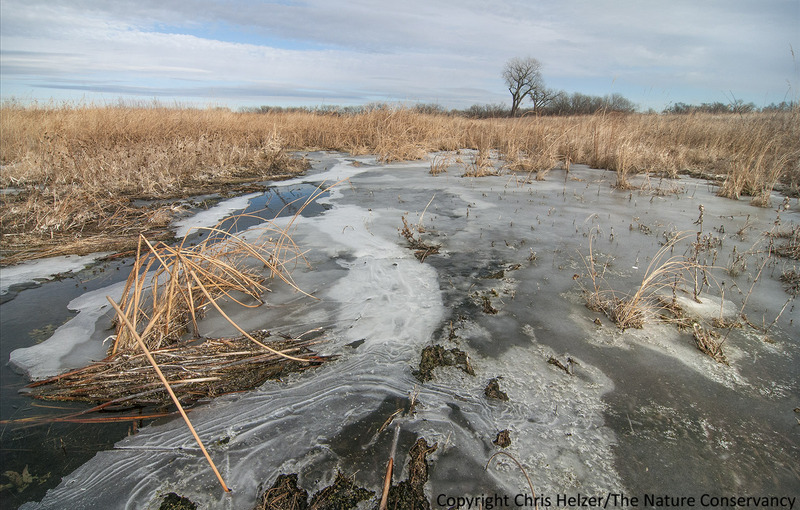 The Nature Conservancy’s Platte River Prairies, Nebraska. The white streaks in the ice created an impression of flowing water even though they weren’t moving. There was, however, water flowing beneath the ice, despite the cold snap we’ve had. Recent strong winds scattered hybrid cattail seeds around the ice in a few places, making interesting photographs, but spelling work for us next year as we try to keep those cattails from taking over too much of the site. Beavers have dammed up much of this restored stream/wetland area, helping us in our effort to create a variety of habitat conditions. The strong groundwater influence of the stream usually keeps it from freezing up completely, even during the coldest periods of winter. 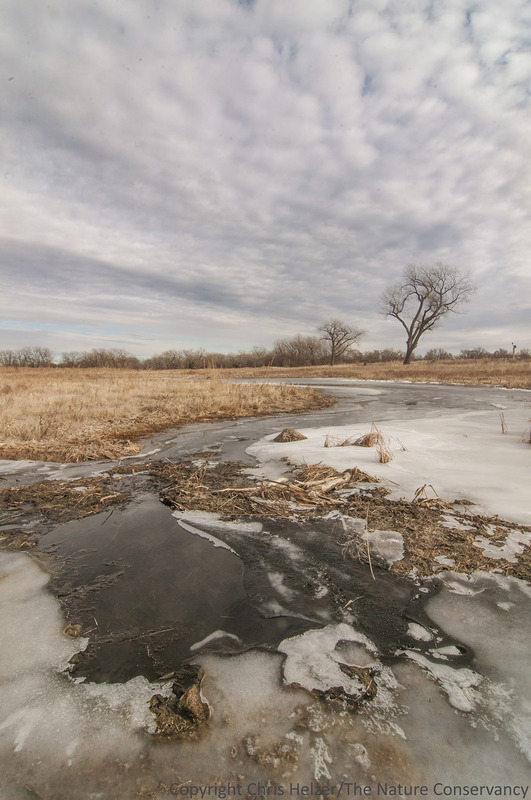 This entry was posted in Prairie Natural History, Prairie Photography and tagged frozen, ice, landscape, photography, restoration, restored wetland, sky, stream, wetland, wetland restoration, winter by Chris Helzer. Bookmark the permalink. Love these photos of winters grip on the land there. Beautiful and I join you in the need for the wide open spaces!!!!! If those cattail seeds are hybrid, will they grow? Stephen, that’s a great question, and one I’d actually never thought about before. To be completely honest, I’m not sure whether the cattails on site are narrow-leaved or hybrid (with broad-leaved). I have a hard time telling them apart. I’ll ask around about seed viability of hybrid cattails, but I’ve never heard anyone talk about it. I’ve just assumed they are viable, but now I’m curious! Thanks for the question. If I learn anything, I’ll let you know. David, we have two main strategies. One attack is simply spot spraying new patches/plants with Rodeo or similar herbicide. The second is suppression through periodic intensive grazing. Our approach depends upon how much area we’re dealing with. It seems like a broad spectrum herbicide could cause a secondary outbreak of bad weeds due to the bare space created? I suppose the intensive grazing could be fairly successful if the cattails are later inundated with water? Can you discuss your observations of the pros and cons of both methods? TNC’s Lulu Lake has been using imazapyr to carefully treat appropriately 1 out of 4 cut cattail stems. The wetland is very high quality, hence the selective method used, and the results have been encouraging. David – you’re absolutely right about potential risks of using broad spectrum herbicides, but it depends upon the scale of treatment (and what’s in the seed bank). We usually spot treat individual plants or small patches, so don’t have much non-target impacts. The annuals that come in most quickly are often (but not always) pretty benign species. In terms of grazing for cattail control, it doesn’t eradicate them, but we can sometimes get 2-4 years of great suppression of cattails after a season (or less) of intensive grazing. In general, the other wetland plants come back much faster, but it’s not a perfect treatment because there are obviously other issues such as soil erosion, compaction, etc that can come into play. 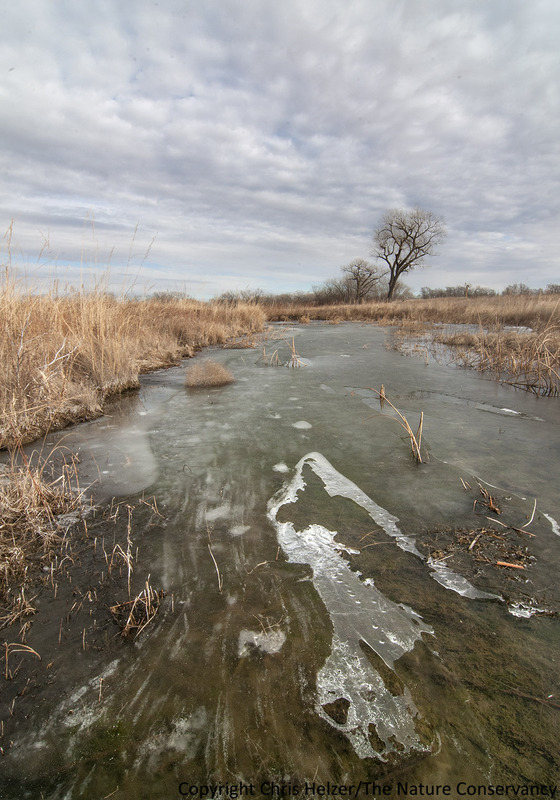 I’ve seen it work pretty well on large infestations where habitat goals are the top priority (e.g., Rainwater Basin wetlands – wildlife management sites in Nebraska) or in some of our restored sedge meadows where there are pockets of deeper water that hold cattails. In the latter example, cattle concentrate in those pools and knock the cattails down but don’t spend time in the slightly higher sedge meadow areas. As long as we don’t graze these areas every year, we’ve been pretty happy with the results. Cattail control is not something we work on a lot, though, so I’m not an expert on this – just sharing what we do and what I’ve seen around this area.